Scotland centre Graeme Morrison has downplayed any injury concerns and is optimistic of taking to the field in Sunday's vital World Cup Pool B clash with Argentina in Wellington. A victory would ensure Scotland's record of reaching the quarter-finals at every World Cup is maintained prior to the final group game against England in Auckland on October 1. Morrison will be crucial against the Pumas but missed training on Sunday due to a slight knee strain having not been considered for the Romania game earlier in the tournament due to a shin problem. However, the 28-year-old Glasgow Warrior is confident he is fit to feature, if selected. Morrison said: "I'm raring to go again. I had a couple of knocks that just needed to settle down and the key was for me to get a good week's training, beginning today. This is a huge game for us. We're delighted with the position we're in, but I suppose you could say the hard work really has to start now. "We've got this game coming up which could determine our future in this competition and that's going to be the sole focus for this week. It's a game I'm desperate to play in. If I'm given a shot I'll give everything for it and I'm confident that if we train well this week and do everything we can preparation wise, we can put together a performance that will make people back home proud, ourselves proud and get a good win for Scotland." 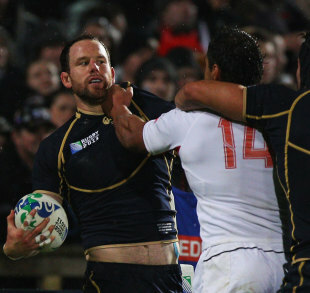 Wins over Romania and Georgia mean Scotland tackle the Pumas chasing a sixth successive win and a last-eight berth. Morrison has shown glimpses of a return to his best form since returning from a knee injury which ruled him out of the Six Nations. He starred in Argentina in June 2010 and believes Scotland can take confidence from their first southern hemisphere Test series success 15 months ago. "There's a lot of guys here that were involved in that and it brought us very close together," he said. "But we realise it didn't come easy, we had to put a lot of work in for that, and that's going to be no different this week. It's something that certainly I'm relishing and looking forward to doing." Conditions in Invercargill dictated the Georgia clash was fought largely among the forwards, but Morrison predicts a more expansive game against the Pumas. He added: "I didn't get too much chance with the ball against Georgia. I think it will be slightly different for the backs this week. "The forwards will rumble on as they have done but the backline are looking forward for an opportunity to attack. I'm sure the coaches have got a few things up their sleeve that we'll try out and I'm very much looking forward to that."